from 15 pcs. 0,62 EUR ea. 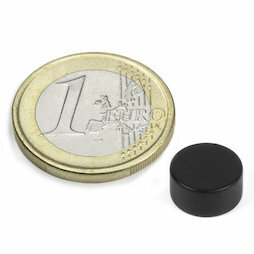 A disc magnet 10 x 5 mm with a Ni-Cu-Ni base coating and a top coat of black or white epoxy resin. It can be glued or cast with epoxy resin. The white paint is similar to RAL 9001 (creme-white) or RAL 9002 (greyish-white). White magnets are pretty much invisible on white magnetic strips or whiteboards, the same goes for black magnets on black ferromagnetic surfaces. 1 pc. 23,40 EUR ea.